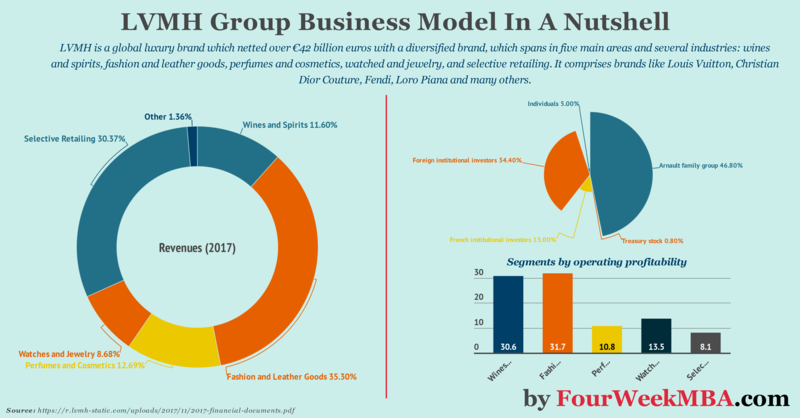 LVMH is a global luxury brand which netted over €42 billion euros with a diversified brand, which spans in five main areas and several industries: wines and spirits, fashion and leather goods, perfumes and cosmetics, watched and jewelry, and selective retailing. It comprises brands like Louis Vuitton, Christian Dior Couture, Fendi, Loro Piana, and many others. It all started when the young Bernard joined the father’s company, which primarily focused on construction. Yet when Bernard Arnault joined the company in 1971, the company began to focus on real estate. Ever since Bernard Arnault grew to become CEO and then drove the father’s company through a series of deals that brought to the creation of LVMH. Today LVM is the largest luxury empire on the globe. Comprising brands like Fendi, Luis Vuitton, and many others. What is the most profitable segment? Where does LVMH make more money? Cultivate an entrepreneurial spirit: LVMH has an agile and decentralized organization that encourages efficiency and responsiveness. It stimulates individual initiative by entrusting each person with meaningful responsibilities. Our entrepreneurial spirit encourages both risk-taking and perseverance. It requires pragmatic thinking and an ability to motivate teams, leading them to achieve ambitious objectives. Around those seven principles, a set of actions are developed and assessed to keep those principles as the guidelines for the company’s ethical growth. When you think of LVMH the brands that comprise the name (Louis Vuitton, Moet Hennessy). However, LVMH group is a galaxy of luxury brands and Maisons, acquired throughout the years by the development and growth campaign of Bernard Arnault. Although those Maisons are part of an ecosystem, they are also autonomously run. Thus, each of those Maisons is based on a business model which is unique to the brand. This kind of organization based on decentralized operations makes the brands part of the LVMH galaxy agile. So that each brand can be connected to its customers, can make decisions fast and still allow its employees to have an entrepreneurial mindset. What brands are part of the wines and spirits? Estates & Wines with products like the creation of the Termanthia Barrel in partnership with Loewe. This segment includes fashion luxury brands such as Christian Dior Couture, Rimowa, Louis Vuitton, Kenzo, Givenchy, Loro Piana, and Fendi. The business group’s operating margin as a percentage of revenue represented the 31.7%. Together with the wines and spirits that is the most profitable segment. With a 31.7% in operating margin for 2017, Fashion and Leather Goods is the most profitable part of the business. Followed by wines and spirits with the 30.6% operating margin and Watches and Jewelry with 13.5% in operating margin. The remaining are Perfumes and Cosmetics with a 10.8% and Selective Retailing with an 8.1% in operating margins. France remains the most significant country and the market for LVMH. As the country where LVMH has its home, France also represents an important market for the company, which keeps generating 10% of its revenues. Other markets like the United States and Japan are pretty important too. France is also the country where most of LVMH stores are located. Even though way smaller than the US market, France counts about 508 stores. One of the critical ingredients of LVMH success is based on its ability to let the Maisons be rung separately while the operations of each are kept agile. This allows the company to be quick at understanding the customers. Also, each mature brand will be used as a cash cow to finance the development of new and less mature brands.